Did you lose your brand new iPad or someone steal it from you? This may happen and it is advisable to stay prepared for such incident. You can setup mechanism on your Apple iPad device for easy tracking and recovering of your stolen or lost iPad. This can be easilydone using Mobile Me service on iPad. 1. Setup Mobile Me account for your iPad device. Click here and then click ‘Free Trial’ button to get going with Mobile Me account creation. 2. After setting up Mobile Me account, goto Settings > Mail, Contacts, Calendars. Then tap on ‘Add account’ option and select Mobile Me on the next screen. 3. Setup Mobile Me account information on iPad. Select ON for ‘Find My iPad’ option under Mobile Me settings screen. 4. Then goto me.com and login into your account. On the Settings page click ‘Find my iPhone’ (this option is for both iPhone and iPad tracking). It will show location of your iPad on the map. Using options on Mobile Me account page, you can flash message on iPad screen or even use remote lock feature to lock stolen iPad. 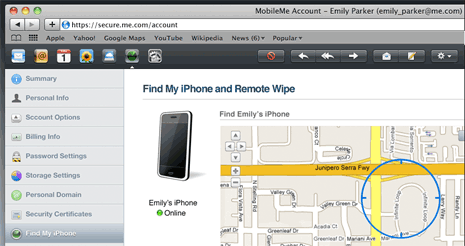 Secure your iPad with Mobile Me service – incase it is lost or stolen.